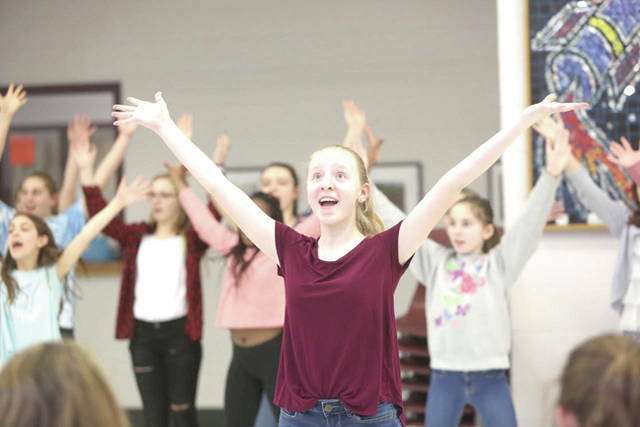 Pictured during a recent rehearsal for “Dear Edwina JR.” is Dempsey Middle School student Audrey Young, who will portray Edwina, the title character, during three upcoming performances of the musical. The musical, which will be held in the auditorium at the Willis Educational Center, 74 W. William St., will be performed three times: 7 p.m. on Friday, April 20; 1 p.m. Saturday, April 21; and 7 p.m. Saturday, April 21. The show features main character Edwina Spoonapple, advice-giver extraordinaire, along with her neighborhood friends. Edwina’s time on stage is spent answering her fans’ questions through hilarious song and dance. According to a press release issued by the Dempsey Drama Club, Edwina has answers for everyone, but this production of her show is especially important due to the fact the talent scout from the Kalamazoo Advice-A-Palooza will be watching. It’s Edwina’s dream to be chosen by the talent scout: her three siblings all have their special talents, and she wants to show the world that she has hers, too. “Dear Edwina JR.” is geared toward the entire family as it features humor for all ages. Tickets can be purchased at the door or online at seatyourself.biz/dempseyms. Tickets are $8 for adults, and $5 for students and senior citizens. With Edwina, the heroine in the musical, being an advice-giver who answers letters through song and dance, students wrote letters asking Edwina for her advice to real and/or fictional problems. Below is the winning letter, written by Morgan Hall, and Edwina’s response, written by fellow Dempsey student Briona Mumper. I have a big problem. Overtime, I set something down, I forget where I put it. When my teacher gives me assignments, I forget to do them. When my Mom gives me chores, I forget I have chores. Once, I forgot to feed my hamster. The next day, he was dead! As you can see, I’m a very forgetful person. Wait … What was I saying? Is there any hope for me? Edwina, is there anything I can do to remember things? I even forgot my birthday! No one forgets their birthday. Ask everyone in the room and they will agree. P.S. I hope I remember to mail this. Wow! It sounds like your forgetfulness is really a problem. It’s an issue that many people struggle with, and a very serious one at that. What if you forget to finish your big school project? Or study for your end-of-the-year test? That would have significant consequences. Fortunately, I have a solution! You need a memory notebook. Every day, take your memory notebook and a pencil with you, and when you come across something you need to remember, write it down! Make sure you’ve got all the details you need to be mindful of. Then, at the end of every day, check your notebook. Cross off chores and homework that you’ve already done, and make sure that everything is crossed off and finished by the time you go to sleep. Also, it’s always a good idea to let your parent or guardian know when you have something that you just need to remember. That way, even if you forget, they can remind you. As a matter of fact, why don’t you tell them about your memory notebook so they can help you remember to get one? After all, I think they’ll be overjoyed when you don’t forget to do your chores! If your memory is bad enough that you’re forgetting life-changing things, it’s also not a bad idea to see your doctor about it. Hopefully, this will fix your problem. Good luck remembering! Follow The Delaware Gazette on Twitter @delgazette.com. Like The Gazette on Facebook.